The Hoboken Mayoral Election of 2017 was an election to determine who will hold the office of Mayor of Hoboken, New Jersey in the upcoming term of 2018-2022. The election took place on November 7, 2017. Incumbent Mayor Dawn Zimmer announced that she would not run for a third term on June 20, 2017, hoping to pursue climate change issues higher up in the chain of government, and endorsed City Councilman Ravinder Bhalla. On November 7, Bhalla was elected mayor of Hoboken, with 32.75% of the vote, becoming the first Sikh mayor in New Jersey history, and the first turbaned Sikh to be elected mayor in the United States. 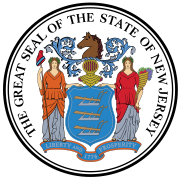 ^ a b "Hudson County General Election 2017, Statement of Vote, November 7, 2017" (PDF). Hudson County Clerk's Office. November 16, 2017. Retrieved December 3, 2017. ^ Heinis, John (June 20, 2017). "Zimmer confirms she won't seek re-election, endorses Bhalla for Hoboken mayor". Hudson County View. Retrieved October 31, 2017. ^ McDonald, Corey (November 7, 2017). "Ravi Bhalla wins Hoboken election, becomes N.J.'s first Sikh mayor". NJ.com. Retrieved November 8, 2017. ^ Otterman, Sharon (2017-11-08). "In a City of Firsts, Hoboken Elects a Sikh as Mayor". The New York Times. ISSN 0362-4331. Retrieved 2017-11-10. ^ "Hoboken Mayoral Race 2017: Candidates on Infrastructure + State Politics". ^ Heinis, John (August 23, 2017). "Hoboken activist Ronald Bautista files 427 petitions for mayoral run". Hudson County View. Retrieved October 31, 2017. ^ Tran, Claire (July 19, 2017). "New Jersey's First Sikh Elected Official Looks to 'Uplift' Community in Mayoral Bid". NBC News. Retrieved October 31, 2017. ^ Kiefer, Eric (May 22, 2017). "Hoboken's Mike DeFusco Launches Campaign For Mayor (VIDEO)". Patch. Retrieved October 31, 2017. ^ Kiefer, Eric (June 28, 2017). "Hoboken Mayor Election: Jen Giattino Officially Throws Hat Into Race". Patch. Retrieved October 31, 2017. ^ Strunsky, Steve (September 18, 2017). "Restaurateur lands top spot on Hoboken mayoral ballot". NJ.com. Retrieved October 31, 2017. ^ Strunsky, Steve (June 26, 2017). "Freeholder Anthony Romano to run for mayor of Hoboken". NJ.com. Retrieved October 31, 2017.